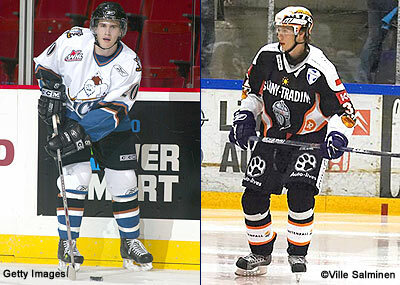 Ryan Russell (left) scored 216 points in 263 regular season games with the WHL's Kootenay Ice. Janne Lahti (right) scored a team-high 20 goals in 56 games with HPK Hameenlinna in the Finnish Elite League in 2006-07. MONTREAL - Canadiens GM Bob Gainey announced Thursday the acquisition of forward Ryan Russell from the New York Rangers, in return for the Club's seventh round selection in the 2007 NHL Entry Draft. The Club proceeded to sign Russell to a three-year contract (2007-08, 2008-09, 2009-20). The Canadiens also announced the signing of free agent forward Janne Lahti to a contract for the 2007-08 season. As per club policy, financial terms of the agreement were not disclosed. In 2006-07, the 20-year old Russell completed his fourth season with the Kootenay Ice of the Western Hockey League. He ranked second on the team in scoring, 16th overall in the WHL, with 76 points in 58 games (30 goals, 46 assists). He was assessed 40 penalty minutes, posted a plus-24 differential and scored 12 power play goals. In the WHL playoffs, he recorded nine points in seven playoff games (3 goals, 6 assists). The 5-foot-11, 175-pound centreman from Caroline, Alberta was the New York Rangers' seventh round selection, 211th overall in 2005 NHL Entry Draft. In four complete seasons with Kootenay, Russell played 263 regular season games totaling 216 points (98 goals, 118 assists), and added 30 points in 33 playoff games (12 goals, 18 assists). In November 2006, he and Canadiens prospect Ben Maxwell, a teammate on the Kootenay Ice, participated in the Canada-Russia Challenge played in Kamloops and Chiliwack. A 24-year old Finnish forward, Lahti recorded 34 points (20 goals, 14 assists) in 56 games with HPK Hameenlinna in the Finnish Elite League. His 20 goals and 87 penalty minutes were team highs. He also registered nine points, including eight goals in nine playoff games (8-1-9). A native of Riihimäki, Finland, Lahti played 255 career games with HPK Hameenlinna since the 2001-02 season. The 6-foot, 200-pound left winger also spent time with the Finnish National Team in 2006-07.